First Time Mama - First Time Blogger: What will Santa bring Julianna for Christmas? Yes yes, I know it's not even Thanksgiving yet... but I already have the Christmas bug! I am one of those freaks that likes to listen to Christmas music before Thanksgiving. I can't wait to put up our tree & decorate for the Holidays! Yeah, that's me! Christmas should be really fun this year for Julianna & we are truly looking forward to it. I love Christmas regardless, but now especially with Julianna being 18 months old, it should be even better than it normally is. For me, Christmas has always been a magical time of year... and now that Julianna can really have fun with it, I am so excited! We plan on putting up the tree on Black Friday. Can't wait!! I just hope she doesn't try to tear down the Christmas tree or eat the ornaments. That will really put a damper on things. This is "Clara" doll made by Haba ... we found this by accident walking through the mall. Haba had a kiosk set up and the Haba woman told us all about how these dolls can be washed (100x over), they're all organic, cloth, and made from non-toxic materials. She was very durable and clearly made well. I had been on the lookout for a well made doll for Julianna for Christmas and here she is! 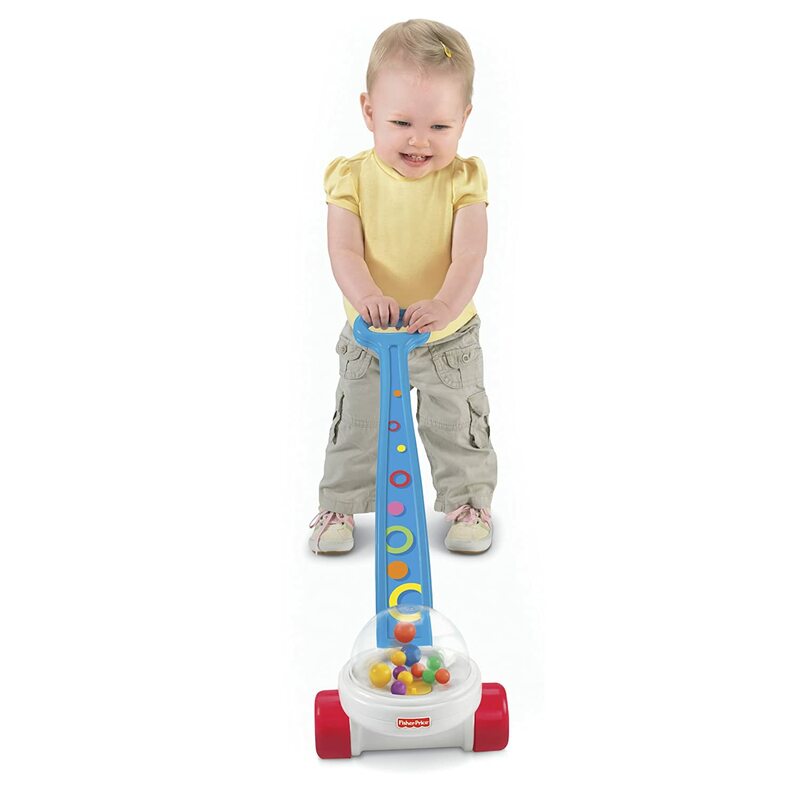 Check out the website for all the Haba toys. I was very impressed with their line of toys! I loooove this chair from the Pottery Barn Kids. We are asking Santa to bring this for Julianna. I Have been looking around for a comfy chair for her. She is really loving sitting in chairs right now. She got a wooden chair from Nana but I also wanted her to have her own lounge chair. I love these from Pottery Barn because the slip cover can be removed & washed. Perfect! This is a "Bilibo" toy. It is a toy for the imagination! Check out the Fat Brain website for more info. I love the idea of this toy. It can used so many ways! 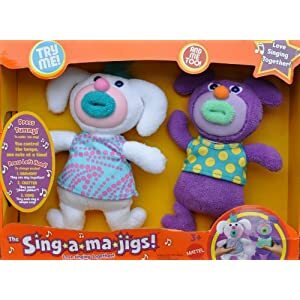 Sing-a-ma-jigs! What can I say? I love these ugly little creatures! Brian and I played with them in the store one day and loved them. Hmmmm who are we really buying these for?!?! 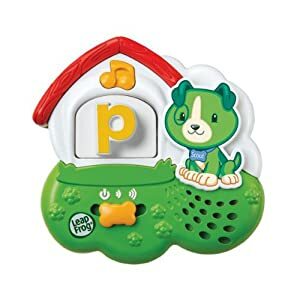 Leapfrog Fridge Phonics. There is a magnet for each letter & it talks. Pretty neato! 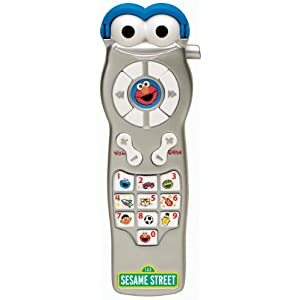 And who could go through childhood without this toy? (I know I had one!) It's the Fisher Price Classic Farmer Says See n Say! Who can resist this little Elephant that pops balls out of his trunk?! (OK yeah that does sound a little weird). 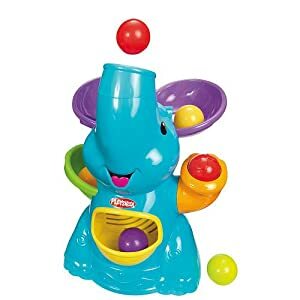 It's the Playskool Poppin' Park Eelefun Busy Ball Popper. Say that 5x over for fun. 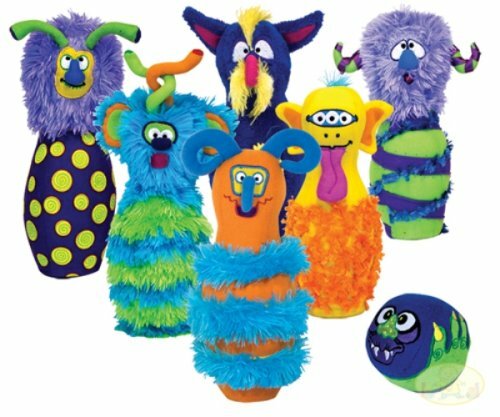 I couldn't resist this Monster bowling set from Melissa & Doug. My husband loves to bowl - and when I saw this, I thought it would be fun to have her learn to bowl with these goofy things. And who can resist the classic Corn Popper push toy? Not me! I have been eyeing this thing up since she was born.... I think Julianna will love it. 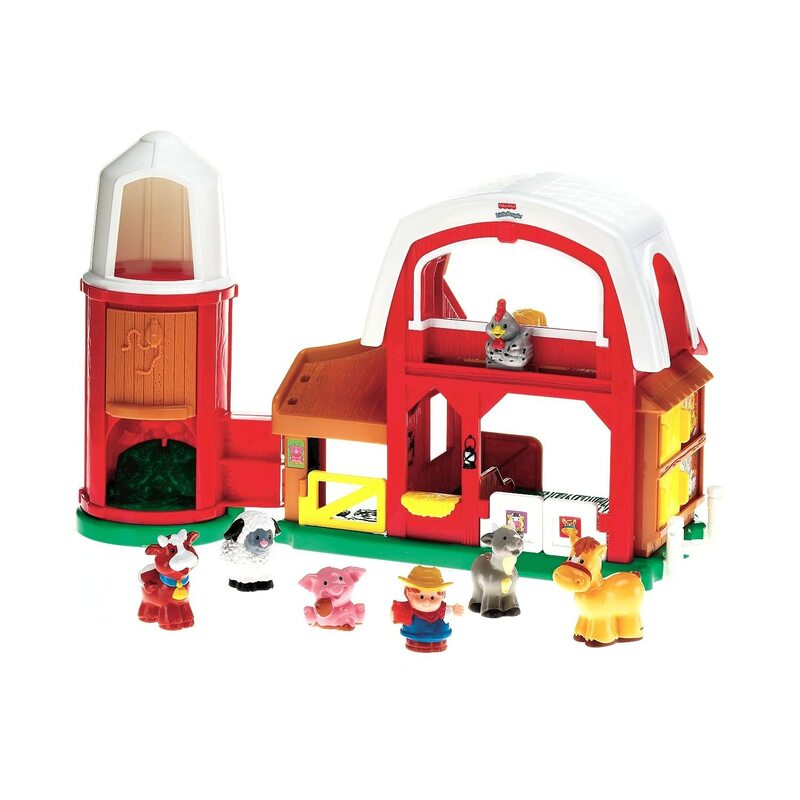 And of course... the Fisher Price barn with the animals! I think this is the one where you open the door, it "Moooos". I loved this as a kid! 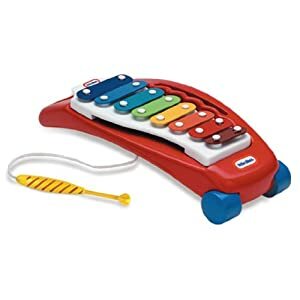 And who could resist the little Xylaphone? 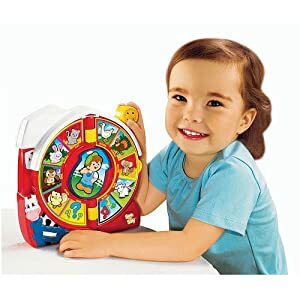 I can't wait to see what she thinks of making her own sounds with it! Maybe she will be a natural musician? Oops!! How did this picture get on here? 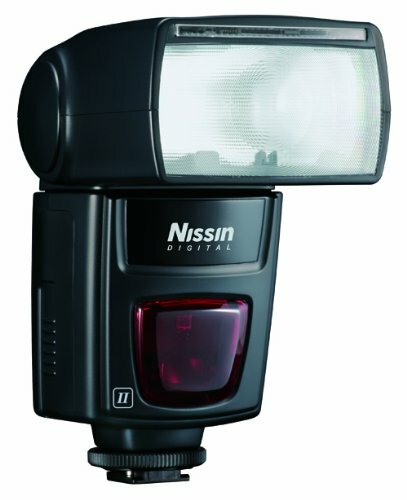 Julianna says that her Mama needs this Speedlight for her Camera. She keeps pointing to it online. OK, well... maybe she doesn't .... but Mama is hoping Santa brings it anyway! Well there's more toys on Julianna's list ... but you get the picture. I go nutty at Christmas. I can't help it... I'm just programmed that way. Look at our living room from last year. We could barely walk! Julianna is gonna get some great gifts this year! Sophia has the anywhere chair and the fisher price barn and loves them both! Stacia- Yesss well... we both loved that Christmas shop... I was ready for Christmas then! LOL We already did some toy shopping - this is pretty early for me! I am actually checking out a kids consignment next week for some things J needs... love those places - we find the coolest things! Aimee- ohhh good to know that sophia loves the chair... i can't wait for julianna to get hers!